[UPDATE & CORRECTION BELOW] On Tuesday, the Los Angeles City Council voted in favor of drafting an ordinance that would ban people from living in their vehicles between the hours of 9 p.m. and 6 a.m. in residential districts, or at any time within one block of a school or park. If passed, the ordinance would allow individuals to live in their cars as long as they are parked on streets zoned for industrial or commercial purposes. According to Councilman Mike Bonin’s office, this would be the first time the city designates specific areas where people can legally sleep in their cars. Ten city council members voted in favor of the ban, three were absent and one, Councilmember Nury Martinez, voted against the ban. Tuesday&apos;s vote asked the L.A. City Attorney&apos;s office to draft new municipal code in line with the restrictions outlined in the above council file. Each night, at least 9,500 people fall asleep inside cars, vans and RVs parked in various neighborhoods around the city. Though the city is proactively attempting to find safe locations for these people to park their vehicles at night, those who live inside their vehicles are, for the time being, parking wherever possible to ensure a peaceful night. Often, wherever possible translates to quiet residential streets in various neighborhoods sprinkled around the city. Unsurprisingly, the residents of homes and apartments on streets where people park their cars-turned-homes dislike the often somewhat dilapidated vehicles being in plain sight. They argue, in letters to the city and public comment sessions, that the raggedy RVs are a safety threat, encourage crime and can result in occupants dumping garbage and sewage on the road with little regard for neighbors. Roads adjacent to schools and schools and especially public parks are also frequently used, prompting similar concerns in those locations. 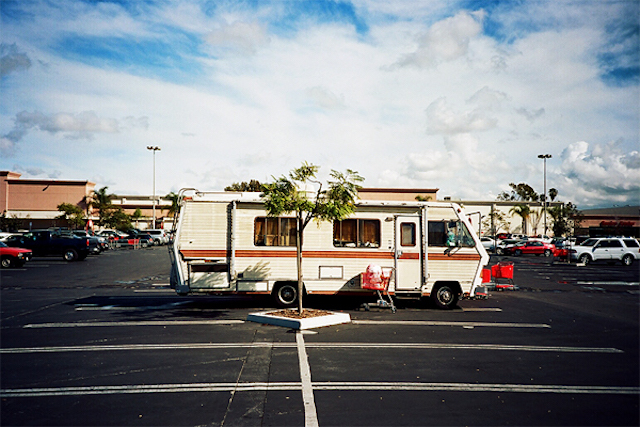 A previous city law, which was struck down by the 9th Circuit Court of Appeals, banned individuals from living in a car, truck or RV parked on public streets. Ruling on the case Desertrain v. Los Angeles, the 9th Circuit judges determined the old ban&apos;s language was "unconstitutionally vague" and promoted "arbitrary and discriminatory enforcement." The 9th Circuit ruling resulted in a $1.1 million settlement paid to the city to the law offices of Carol Sobel, a Santa Monica based attorney who&apos;s successfully sued the city multiple times over homeless related issues. During Tuesday’s Council meeting, several council members spoke about how they wanted to ensure that the motion in question does not impede the ultimate implementation of a safe parking program in the city (the city is in the process of considering a program that would allow for individuals to park their cars overnight in designated lots around the city). The motion passed on Thursday also includes a fine schedule for those found to be violating the city&apos;s new statute. The first time someone is found to be illegally living in a vehicle, they will be cited $25. That amount increases to $50 the second time, and then to $75 for all following citations. This schedule also includes provision for an initial warning, awarded without a fine. [UPDATE & CORRECTION] An earlier version of this post incorrectly stated that the ban had been voted into law; the City Council voted to direct the City Attorney&apos;s office to draft an ordinance. The post was also revised to more accurately reflect the fact that the potential ordinance would allow individuals to legally sleep in their cars on streets zoned for industrial or commercial uses.